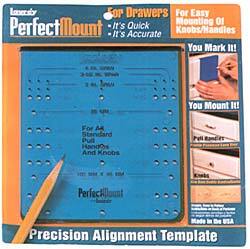 The Laurey Perfect Mount Template is and precision alignment guide for easy mounting of cabinet knobs and pulls on cabinet drawers. For standard pull mounting hole spacing of 3in. ; 3-1/2in. ; 3-3/4in. (96mm); 4in. and single hole knobs. Includes simple, easy to follow instructions.